Found Footage 3D continues to steamroll over the competition, winning another three awards this weekend. After two very successful, sold-out festival screenings, the reviews are starting to come in and frankly they are better than we could possibly have hoped for. Found footage is notoriously NOT a critic-friendly subgenre, but in our case the critics seem to agree with the audience and have had almost universally positive things to say about the film. We are grateful and humbled by the outpouring of support. Highlights from some of our favorite reviews are below. You can find even more on our reviews page. Read even more reviews here. 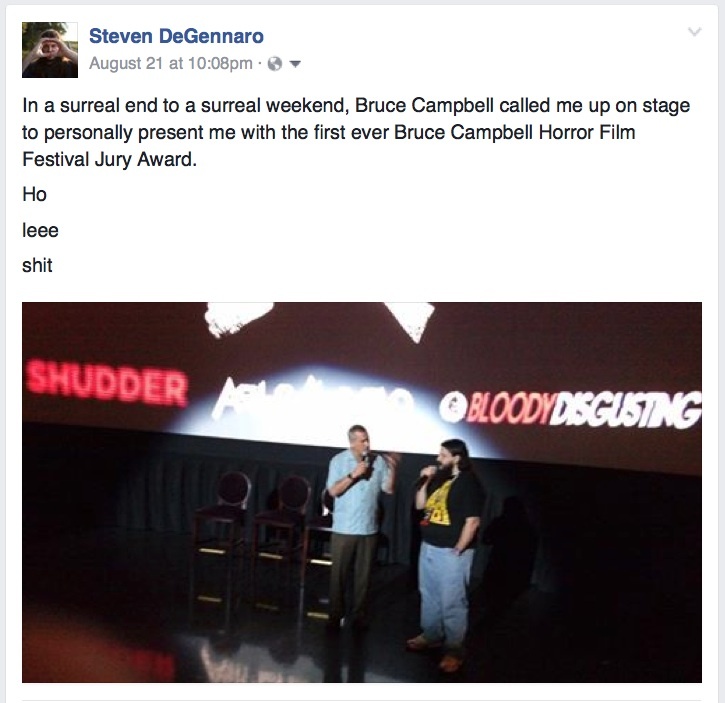 The first ever Jury Award from the Bruce Campbell Horror Film Festival went to FOUND FOOTAGE 3D! We are thrilled beyond words to be honored by the esteemed jury, which included the Groovy Man himself, legendary writer/director Tom Holland (Child’s Play, Fright Night, Psycho II), actress Cerina Vincent (Cabin Fever), festival programmer (and producer of He Never Died) Zach Hagen, and actor Barry Bostwick (The Rocky Horror Picture Show). Thank you so much Bruce and friends! Make it big. Make it loud. Watch it twice. (But not 3 times… don’t want too much spoiled!) Share with friends and family. And buy your tickets to our world premiere (Chicago, August 20th) or international premiere (London, August 29th). And if you want to see it in all its 3D glory (via your 3D TV, red-blue glasses, VR goggles, or Google Cardboard), log in to our backstage area. Tickets for both of our premiere screenings are now on sale. Grab them before they sell out! Tickets to our World Premiere at Bruce Campbell’s Horror Film Festival (Saturday, Aug. 20th at 10pm) can be purchased here. Badges to attend the entire 4-day festival can be purchased here. Tickets to our international premiere at FrightFest London (Monday, Aug. 29th at 6:30pm) can be purchased here. FrightFest festival and day passes can be purchased here. If you are interested in being a part of our street team at either festival in exchange for a free ticket, contact us ASAP at foundfootage3d@gmail.com. We’d love your help! At long last… the wait is over! Found Footage 3D will get its world premiere at Bruce Campbell Horror Film Festival in Chicago, August 18-22. And in one of the most epic one-two punches of all time, the film will have its international/European premiere the following weekend at the very prestigious FrightFest London. We could not be happier about both of these festivals and we are thrilled and honored to have been chosen. Writer/Director Steven DeGennaro, Producer/Actor Scott Weinberg, Producer Charles Mulford, and several of the actors will be in attendance at both festivals. More details to come soon. Mark your calendars! We will be posting more as the fest dates approach, and we will have a very special surprise in the final weeks leading up to the festival. Keep checking back for info and updates. Or better yet, sign up for our mailing list so you don’t miss a thing! And if you live in Chicago or London and would be interested in being a part of our street team in exchange for a seat at the screening, contact us. We could use your help and we would love to see you there! 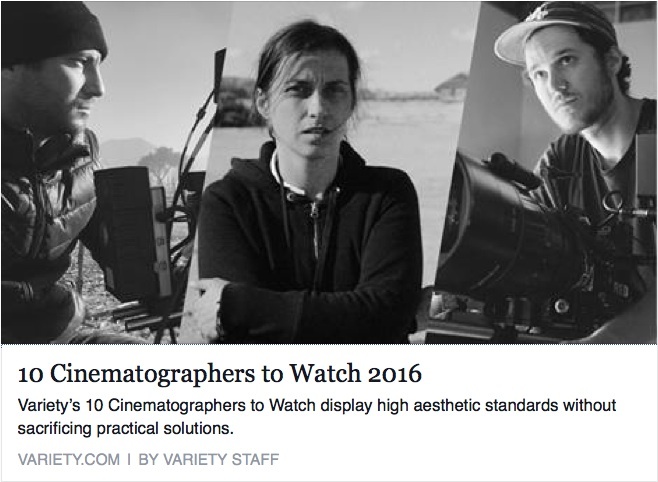 I can’t even begin to say how proud I am that my friend and closest creative collaborator Drew Daniels was named one of Variety’s “10 Cinematographers to Watch in 2016”. I’ve known how amazingly brilliant Drew is for years, of course, which is why he has shot every movie that I’ve directed. He is one of the absolute most talented people I’ve ever worked with. I’m not exaggerating when I say that if I had a choice between Lubeski, Deakins, Kaminski, or Drew, I’d pick Drew. I have no doubt that he will be on the Oscar stage some time in the next decade, and I only hope that I can continue to get to work with him for years to come. For the second year running, I saw my favorite film of the year at Fantastic Fest. Last year I opted to not include festival movies that had not been released to the general public by the end of the year. This year, I’m taking a cue from Simon Barrett and including any movie I saw in calendar 2015. This not only saves me having to compare movies I saw nearly two full years ago with stuff I just saw last week, but it also gives me an opportunity to put some great movies on your radars so that when they do finally come out, you can make sure to see them.